Fourteen-year-old Sophronia is a great trial to her poor mother. Sophronia is more interested in dismantling clocks and climbing trees than proper manners - and the family can only hope that company never sees her atrocious curtsy. Mrs. Temminnick is desperate for her daughter to become a proper lady. So she enrolls Sophronia in Mademoiselle Geraldine's Finishing Academy for Young Ladies of Quality. But Sophronia soon realizes the school is not quite what her mother might have hoped. At Mademoiselle Geraldine's young ladies learn to finish...everything. Certainly, they learn the fine arts of dance, dress, and etiquette, but they also learn to deal out death, diversion, and espionage - in the politest possible ways, of course. Sophronia and her friends are in for a rousing first year's education. Absolutely loved the story. The characters are fantastic and energetic. well worth a listen to. 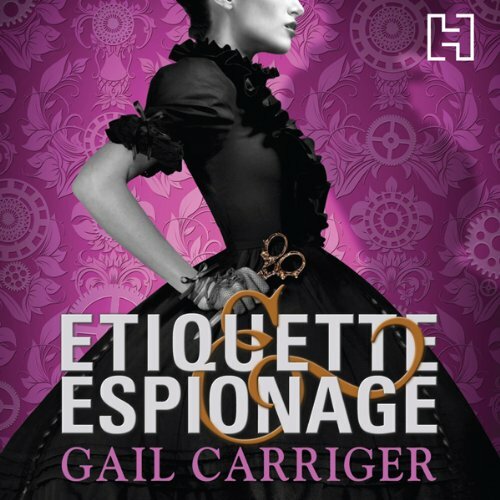 Where does Etiquette and Espionage rank among all the audiobooks you’ve listened to so far? This book has and interesting premise mixed with a great bunch of MC's and put in a surprising time period. This mix adds up to a delightful read that demands you read the rest of the series asap. Best setting ever for fabulous fun! Would you consider the audio edition of Etiquette and Espionage to be better than the print version? School has never been such fun! Read this book, it's awesome! Harry Potter meets H.I.V.E., SteamPunk and Flavia deLuce with a few werewolfs (OK, no vampires in HP and H.I.V.E.) and vampires thrown in... Highflymen! Gosh, you have to come up with that - that is not Robin Hood that is the lesser Red Breasted Robin, or is it...? What I want to tell you is: you are looking for a very clever, intelligent, ingenious (see above), hilarious and phantasically entertaining book with a (repeat see above) plot, THIS IS IT!